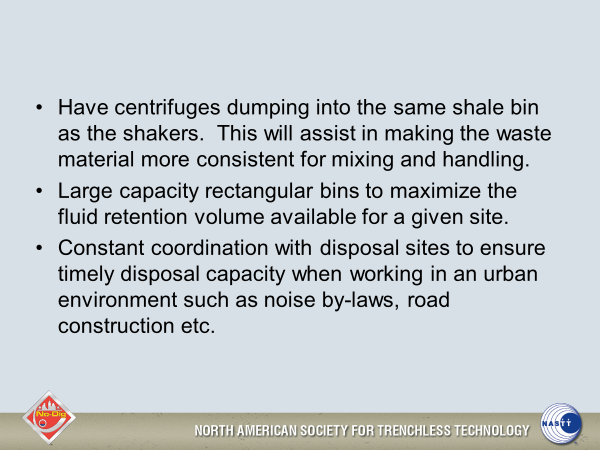 Drilling fluid and cuttings from Horizontal Directional Drilling (HDD) and Direct Pipe (DP) Installations is considered a regulated waste in most parts of the country and as such requires some detailed planning prior to a project’s initiation. This was the case for some very large pipeline projects constructed recently in Toronto, Ontario Canada. Large diameter pipeline projects with HDDs and DPs can generate thousands of cubic metres of waste cuttings and fluid for disposal. 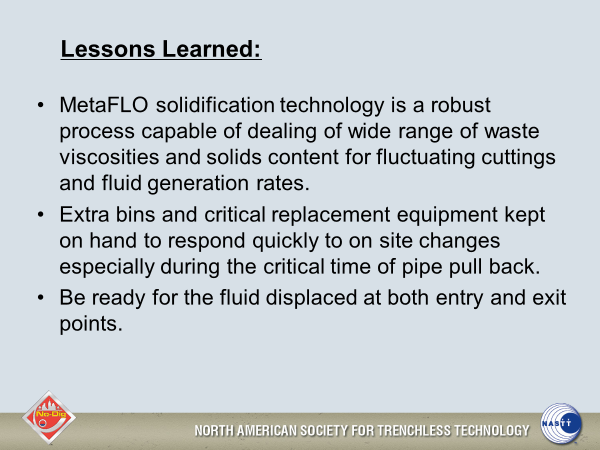 When a project has large volumes of cuttings and fluid that need to be handled, this becomes a difficult and expensive but very necessary part of a pipeline project. These volumes are not generated all at once but at varying times during the project. Careful planning is required to enable efficient solidification. Fluid and cuttings management becomes significantly more difficult and expensive in large urban settings like Toronto. 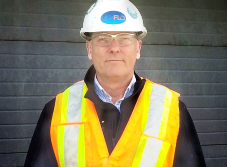 In Toronto, three large pipeline projects with as many as 20 large diameter directional drills/direct pipe installations selected a liquid solidification process to facilitate the soil disposal requirements. 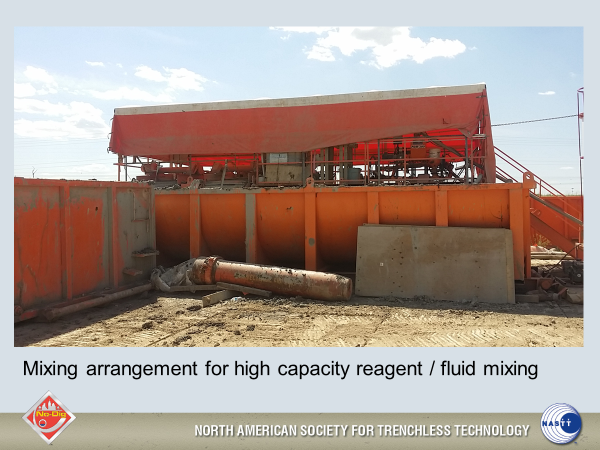 This involved the use of specialized mixing equipment to add a reagent to ‘solidify’ the cuttings and fluid enabling the use of common dump trucks to transport the solidified material. 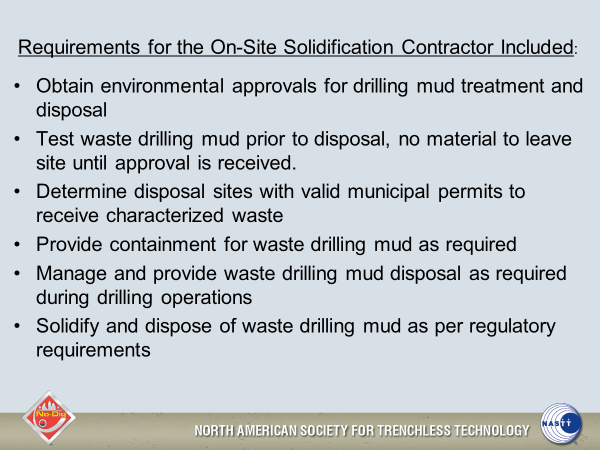 This allowed for disposal at local clean fill operations. The material had been previously tested and shown to meet the necessary environmental disposal requirements. This paper will describe the process and the decisions that were made to handle the large volumes of drilling fluid and cuttings generated in a very environmentally sensitive manner. The purpose of the Greater Toronto Area (GTA) Project is to reinforce Enbridge Gas Distribution’s (EGD) extra high pressure (XHP) system to manage operational risks and meet growth needs from 2015 to 2025. The XHP system in the Greater Toronto Area (GTA) was last reinforced in 1992. Aside from meeting growth needs, the project will enhance the system’s safety and reliability by providing critical backup facilities, which will allow for pressure reductions in older high pressure gas mains and eliminate system bottlenecks. The GTA Project consists of both pipelines and facilities. The pipeline scope is split in two separate segments of different sizes. The western segment is an NPS 42 transmission pipeline and the eastern segment is an NPS 36 distribution pipeline. The western segment is a 26.3km NPS 42 pipeline originating at a new facility called Parkway West Gate Station and ends at Albion Station. The pipeline primarily runs through a designated utility corridor adjacent to Hwy 407, a major toll road in Toronto, terminating at an existing pressure reducing station called Albion Station. This station is being upgraded as part of the GTA Project. This pipeline is designed as a CSA class 4 location and operates at less than 40% SMYS at a normal operating pressure of 936 psi. This segment is a shared pipeline with TransCanada Pipelines and as such is a transmission pipeline transporting un-odourized gas. The pipeline crosses 14 water courses, 25 highways and roads, 14 rails and 20 foreign pipelines. Out of these crossings there are a total of 8 horizontal directional drills (HDDs) and 2 Direct Pipe installations. The eastern segment is a 23.0 km NPS 36 pipeline originating at an existing facility called Keele/CNR Feeder Station which will undergo minor modification as part of the GTA Project. The pipeline primarily runs through a designated utility corridor adjacent to Hwy 407 for approximately 15.4 km before turning south down a hydro corridor for another 7.6 km where it ties into an existing NPS 36 pipeline. This pipeline is also designed as a CSA class 4 location and operates at less than 30% SMYS with a maximum operating pressure of 650 psi but normally operating at 485 psi. This segment is part of the distribution system and delivers odourized gas to various points in the distribution network. The pipeline crosses 9 water courses, 31 highways and roads, 6 rails and 5 foreign pipeline crossings. Out of these crossings there are a total of 9 HDDs and one Direct Pipe.